6 x 6, or 6 x 7. Is there a difference, and why the different markings? Years ago, when tomatoes were first packed and shipped throughout the country, the majority of the packing was done by hand, placing each tomato into the carton. The tomatoes were uniformly sized by the packer to place the tomatoes in rows, such as 6 tomatoes across one way and 6 tomatoes across the other, hence the 6 x 6 pack. If the tomatoes were larger, the packer could only fit 5 tomatoes one way, while placing 6 tomatoes across, making that a 5 x 6 pack, shown above. Actual size dimensions (minimum diameter and maximum diameter) were later established for a 6 x 6 tomato as well as the other packs, such as a 4 x 5, 5 x 6, 6 x 7 and a 7 x 7. We still see this concept today in tray packs, although the tomatoes are no longer being sized by the judgement of the packer. Many of the larger tomato packers and re-packers size their tomatoes using optical technology. 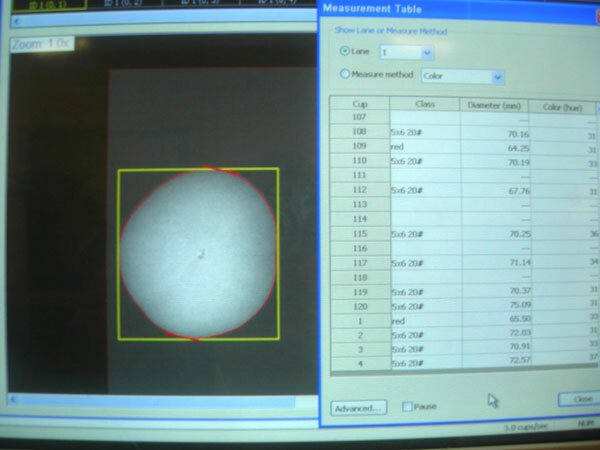 The tomatoes pass under cameras which instantaneously take a picture, and measure the size, and send that tomato to the correct packing line. As you can see, the tomatoes are measured to the hundredth of millimeter, ensuring the tomatoes are packed in the carton, with the designated size. But let’s get back to the beginning…….why the different designations? When the U.S. Grade Standards for Tomatoes was developed a uniform method of sizing tomatoes was established. The tomato industry across the United States requested a simple method, so 4 size categories were created, small, medium, large and extra large. Size designations were set, for each size. For example, a tomato marked as Large means it must be larger than 2-1/2 inches in diameter but no larger than 2-25/32 inches in diameter, to keep the tomatoes fairly uniform in size. 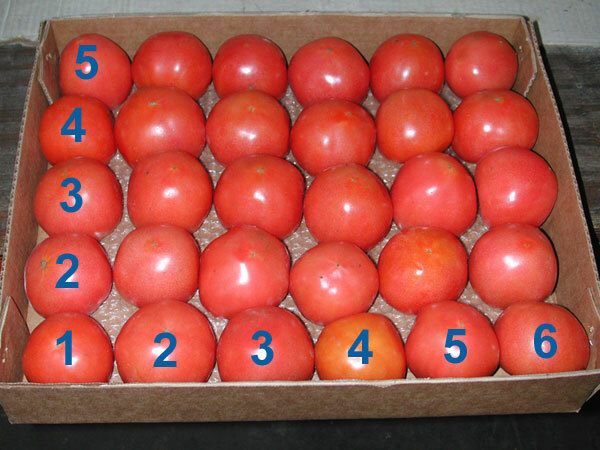 The Florida Tomato Industry decided to keep the established method of sizing tomatoes, so they do not use the U.S. Grade Standard size designations, they still use most of the original size terms. 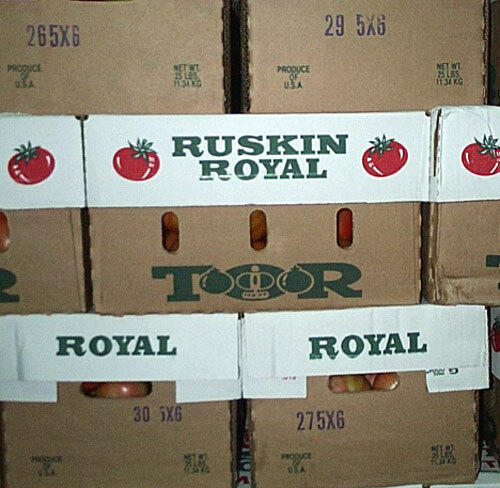 The Florida growers pack their tomatoes to three size designations, 5 x 6, 6 x 6 and 6 x 7. The size designations they established are a little different than the U.S. Grade Standard sizes. For example, a 6 x 6 is similar to the Large tomato, but the minimum diameter for a 6 x 6 tomatoes is 2-17/32 of an inch, 1/32 larger than the large size. The maximum diameter of a 6 x 6 is 2-29/32 of an inch, 4/32 of an inch larger than the large size. If you need to purchase one or both of the sizers, they are available for purchase from the USDA Inspection Service’s Supply Depot. 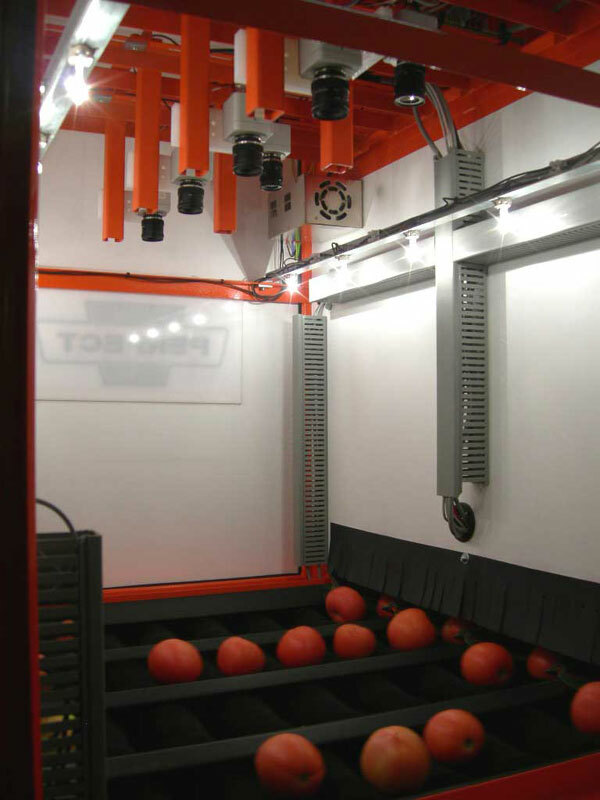 Click here for the link to their inspection equipment catalog. I purchased both sizers, but I’m not sure how to use it. Do you know of a presentation (Youtube or PowerPoint) that explain how to use them? Thank you for your question. I am sorry to say I do not have a presentation explaining the proper procedure for sizing tomatoes as I rely on demonstrations during grading exercises to train the participants. When sizing the tomatoes you have to first determine which sizer you should be using. 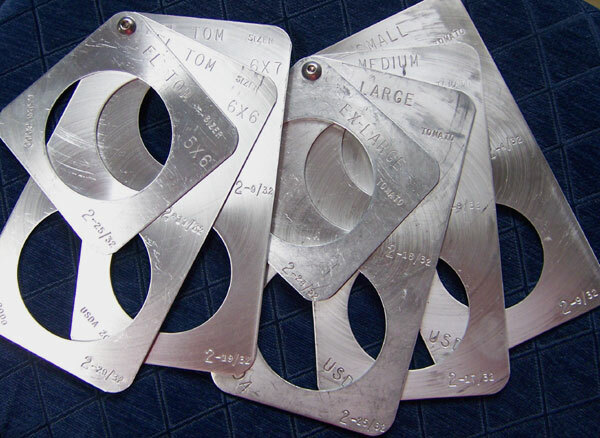 If the cartons are marked to numerical sizes (6×6 or 5×6) you would use the Florida sizer. If the cartons are marked with size designations (medium, large, etc.) you would use the USDA sizer. To use the sizer, let’s say the cartons are marked as 6×6. Using the Florida sizer for 6×6 you will notice two holes, one for measuring the minimum diameter and one for measuring the maximum diameter. In other words for a tomato to be designated as a 6×6 it must not pass through the small hole, but it must pass through the large hole. When measuring for the minimum diameter the tomato must be held with the stem up; and if it falls through the hole it is too small, or undersize. When measuring a tomato for the maximum size you are allowed to roll the tomato around to see if it passes through the larger hole in any direction. If the tomato is too large and does not pass through the opening it is considered oversize. I hope I was able to answer your question. Let me know if I can be of further help. Your presentaion is quite thorough however I don’t know how the size relates to the weight of tomatoes. Kanti, thanks for your question. The sizes for tomatoes are all based on minimum and maximum diameters, not by weight. But many tomato packing houses may actually weigh tomatoes, and based on their own calculations they determine which size the tomato shall be packed, depending on the weight of their own tomatoes. Regardless, the tomatoes still must meet the minimum/maximum size diameter designations established by the industry. To summarize, there are no industry standards for the minimum/maximum weights of tomatoes, for their size. Do you know where I can buy a belt to make a tomato grader? I mean a grader table to size tomatoes.